Hey Sally, come look at this. The clownfish spawned! Yeah, look at that egg patch, there must be 500 little yellow eggs there. And Joe is working them over with his fins and Sally is chasing off all the other fish. They’re so cute. Wow, the eggs are still there and they’re all dark and silvery now. I think that they are going to hatch soon. Do you think we can we raise them, Joe? Maybe, you know they sell for $6.00 apiece in the pet shop. Let’s see, 500 fish at $6.00 each, gee, that’s $3000.00 dollars. You know, since Sam moved out we have that spare room in the back now that we don’t use much. We could set up a little hatchery in that room. We could move the tanks we have in the bathroom, the bedroom, the kitchen and the family room in there. Just leave the big reef tank in the living room, and that would put all the maintenance in just one place. And sale of the fish would sure help the bottom line around here…. Yeah, I read that they spawn every ten days or so. That would be about $6,000.00 a month. We could quit our jobs! But if they hatch, how are we going to raise them? The eggs are so tiny. Maybe just put a little liquid fry food in the tank? Boy, am I glad you’re home. Pair 7 and pair 12 spawned today, pairs 3, 5 and 10 are due to hatch tonight, three larva tanks need to be cleaned, we’re almost out of algae paste for the rotifer cultures, you’re going to have to make up some vegetable juice formula for them until the new algae paste shipment arrives, we have to count, pack and ship the fish from grow-out tanks 4 and 5 to make room for the new juveniles out of larval tanks 2 and 4, and I accidentally overflowed the salt mix tank so we have to clean up the floor also. And on top of that, there are some funny white spots on the juveniles in grow-out tank 1. And that store on Clover Street, Funny Fancy Fish, just dropped the price that they pay on the clowns to $1.50, they say their overstocked. Don’t plan on going to bed tonight! Ahhh… The joys of marine fish culture. Photo 1. The simplest type of grow-out tank works well but it can be easily overloaded. This 75 gallon tank is equipped with a foam pad on the bottom that serves as an “undergravel” filter. The foam pad can be easily cleaned between batches of juveniles. This particular spawn produced 952 juveniles, all grown to 3/4 inch size in the same tank. Photo 2. 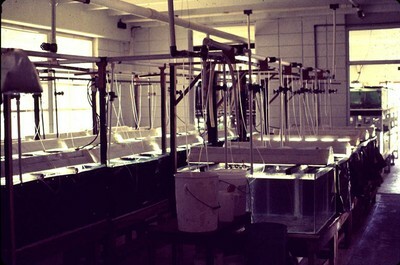 The Aqualife grow-out system in the Keys installation in the late 1970s. Wooden stands, overhead delivery of water and electricity for the lights, and a semi open system made for a functional, no frills grow-out system that delivered partially grown out fish to the 300 gallon tanks in the outside grow-out system. Photo 3. 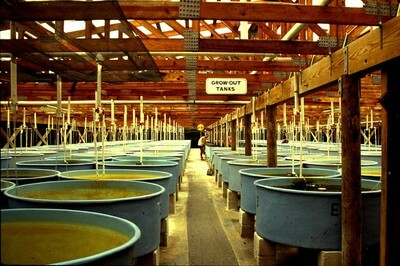 The Aqualife grow-out system on Walkers Cay in the late 1980s contained a couple of hundred 300 gallon tanks. Each tank had its own water input and lighting was delivered by the translucent roof. The large yellow ball with the red circles barely discernable just over the head of the grow- out technician is designed to scare off birds. Herons would occasionally get into the grow-out area and fill up on clownfish. The water system was open but the volume of exchange could be controlled with a valve on each tank. Those marine fish breeders that find success through a lot of vision, hard work, passion and dedication soon learn that making a hatchery out of a hobby creates a different breed of cat, sort of like turning a kitten into a lion. It can take over your life. But it that’s what you want to do, you will soon find out that treatment of water in a grow-out system in the culture of marine ornamental fish and invertebrates is a situation quite different from the maintenance of a typical marine aquarium system. Assuming that the culture project is successful, a grow-out system will contain a biomass that begins relatively small with numerous post-larval juveniles and expands relatively rapidly as the animals grow to large juvenile or young adults. The feeding regimen also changes, typically with live food quickly giving way to dry and/or wet particles of processed feed. Then, as the animals are transferred out of the system for sale or dispersal to other systems, the biomass in the system declines either rapidly or slowly. This pattern of increasing and decreasing bioload in the system requires filtration that can adapt to these changing demands. In a grow-out system that demands maximum production of organisms in the available space, the need for flexible filtration is essential. Filtration methods that can adjust rapidly to changing demands, such as protein skimming and mechanical particle removal helps maintain a stable system. Highly efficient biological filtration methods such as fluidized bed filters and rotating disks are most useful when they can be moved, or water flows redirected, from tank to tank as the biological filtration demands change from tank to tank or system to system. A successful marine aquarist who becomes a successful breeder has to reevaluate the methods and practices of filtration on grow-systems. In relatively large-scale culture, methods that are successful on display and brood stock systems are usually not adequate for grow-out systems. and the financial return from the cultured organisms. There is always the need to maximize survival and reduce costs of production. After the capital costs, food and water treatment practice most greatly affect survival, and thus the bottom line in marine organism culture. There are three basic types of grow-out systems. These are open systems where water is taken from a natural source, treated as necessary, put through the system and then discarded, and a closed system where water is recirculated through all necessary filtration and treatment and reused in a system as long as possible. The third is a hybrid of these two where a source of natural water is available, but recirculation with variable filtration is employed to create the best system for both function and economics. In all these water management schemes, after adequate water quality is assured, elimination and/or control of disease organisms rapidly becomes absolutely essential. In a grow-out tank, it is basically impossible to eliminate a disease problem through rapid water flow alone unless the incoming water contains a powerful enough chemical agent that can permeate the tank to the degree that the disease organism is totally destroyed. There are two basic rules in the construction and operation of a grow-out system. 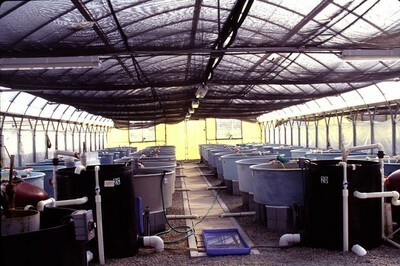 Construct each grow-out tank so that it is independent in water flow from every other grow-out tank. In an open system this means that each tank has its own water supply that originates from the source. No tank should ever flow into another tank. In a closed system this means that there is a barrier of some sort that prevents infection from traveling from one tank to another. A type of filtration, usually a very effective ultraviolet filter, must be placed to isolate each tank from a microorganism infection that might be in another tank. When disease is observed in one grow-out tank, immediately isolate and treat that tank appropriately. Also make every effort to avoid contamination between tanks by sterilization of nets, siphons, and tools between uses and washing hands between working in different tanks. A breeder of ornamental marine organisms (or any other aquatic organism for that matter) soon learns that, careful or not, a disease can wipe out months of effort and expense in space of a few hours or days. Given good water quality and good nutrition, probably the most common and destructive disease problem in marine fish culture are protozoan parasites, in particular the dinoflagellate, Amyloodinium ocellatum. 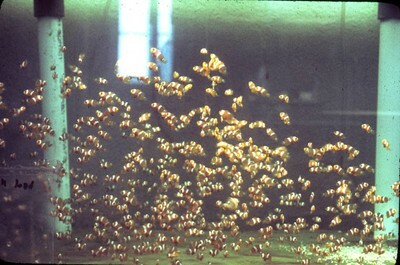 This bug is especially insidious because it can propagate in both closed and open systems within a single grow-out tank despite large volume changes within a short period of time, can easily get carried from tank to tank, and is quickly lethal to most fish once large numbers have infested a fish. There are many various treatments for this parasite out there, but the most effective treatment that I have found, at least in a cultured fish grow-out tank, is use of citrated copper. In fact, in the open system grow-out set ups that I have used in the past, we use a metering pump to add citrated copper to the incoming water at levels of between 0.05 and 0.1 ppm to prevent this organism from invading the grow-out tanks. Photo 4. Even more sophisticated is the grow system at ORA. A foot bath prevents carrying disease organisms from other areas and each tank has its own water supply. In our hybrid systems, the water was treated with chlorine and/or copper in a storage tank before use to prevent introduction of protozoan parasites. In a totally closed system that uses artificial seawater for exchange, the only source of protozoan parasites is introduction from wild fish or other organisms or material introduced from wild sources. In this case quarantine for three weeks and/or treatment is the only barrier to potential infection. 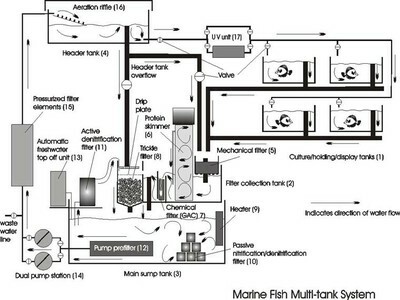 Totally separate systems for incoming fish, larval rearing, and grow-out are also important not only for management of water treatment but also as a barrier to transmission of disease organisms. The brood stock, the “seed corn” of the operation, must be protected by all means possible from introduction of parasitic disease. Of course, there is the potential for infection from either spontaneous generation or just plain magic, both of which I think I have experienced. enough, the fish recover completely. Any fish that are not moved are doomed. The signs of the syndrome are rapid gilling, rapid loss of body mass (probably due to loss of water from body tissues), heading all in the same direction toward incoming water flow, and a noticeable shimmy in the swimming motion. We termed this condition the “toxic tank syndrome” and it was the primary reason for turning our early fish farm to open rather than closed grow-out systems. This same syndrome may also be responsible for the great difficulty we had with culture of the large French and gray Atlantic angelfish, Pomacanthus spp. We could not rear them through the larval stages in any numbers until we began using the antibiotic streptomycin in low levels in the larva tanks. The success of this treatment certainly pointed to a bacterial toxin as the cause of the problem. However, antibiotics and other expensive chemical treatments in grow-out systems with large volume water exchange and/or biological filtration is certainly not cost effective. Use of antibiotics as a water treatment makes sense when used as a temporary treatment in a grow-out tank without water flow but not as continuous prophylactic large-scale treatment of an entire system. When antibiotic treatment of a tank or system of grow-out fish is required, it can be economically and biologically effective to put the treatment in the food of the fish rather than in the water. That way the treatment, usually an antibiotic, is delivered most effectively to the target organism and the presence of the antibiotic in the water is minimized. The effect of any treatment in a grow-out system on the biological filtration must be considered before application of the treatment. This is one of the strongest reasons for building in physical separations and the potential of individual operation of each grow-out tank.